With the latest Chrome 57 we not only get the most efficient Chrome version ever... but also a Chrome that stops us from accessing Flash sites. Thankfully, there's an easy workaround. There are countless sites using Flash in a "bad way", and where it makes complete sense to block it completely; but on the other hand there are still a few sites using Flash that you might need/want to use, having no real HTML5 alternatives as of yet. For me, one of my personal favorites is Sumopaint, a real "Photoshop" on the web, perfect to do some quick image or photo editing wherever I may be, no installation required. And I guess many other will have their own Flash sites (like games, and so on) that they'll still may want to access on the latest Chrome. Fortunately - at least for now - it's something that can easily be fixed. 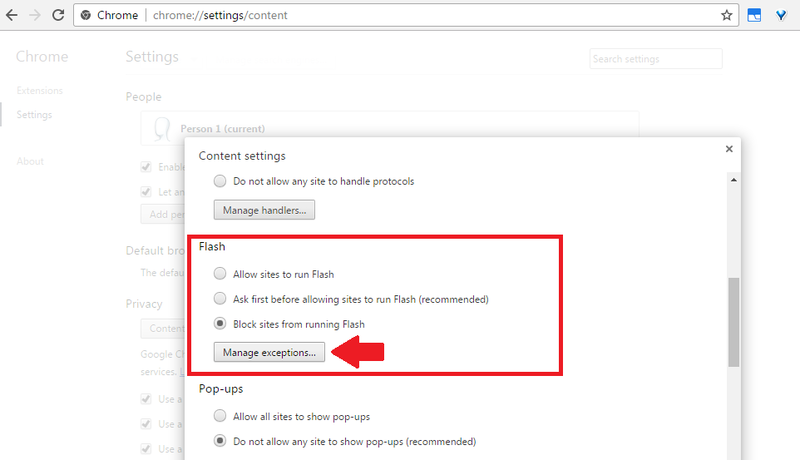 Just go into: Settings->(Show Advanced Settings)->Content Settings->Manage Exceptions (in the Flash section). In here you'll be able to add your regularly used Flash sites as exceptions, so they can still work. Eventually, the time will come for Flash to die off completely, but at least for now, we can still keep using it.